I had briefly mentioned WordPress Answers (clumsy name we shouldn’t have ended up with so I’ll just use WPSE further) in post about Stack Exchange network as a whole. After period of public beta (lasted somewhat longer than initially expected) WPSE had officially graduated to be part of the network. Just out of beta might seem young, but there is already a lot of worthy stuff on site. 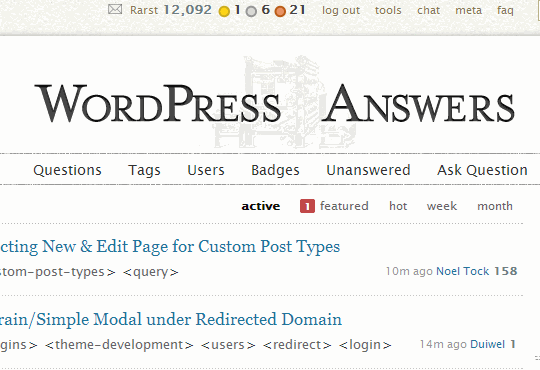 WPSE is simply put a place where you can ask and answer questions about WordPress sites (mostly self-hosted WordPress.org version, but WordPress.com fits as well). The valuable part is strong focus on quality. There is a lot of content about WordPress being generated online and a lot of it is of alarmingly poor quality or quickly becomes outdated. WPSE is not so much about churning out quantity, as letting its community rate the quality of information. Resulting individual ratings of users make it game-like and keep participating experts motivated and in check. Site has attracted plenty of amazingly good experts. It may not contain many names you hear in more general WordPress community, but I had seen these people take down extremely complex questions with precise answers and some great code. On a regular basis. Where can I download WordPress themes from? The one area where site still comes short is that it gets harder to get good answer for questions farther from WordPress core. Plenty of questions on specific plugins and related projects (such as bbPress and BuddyPress) stay unanswered, because there is not enough experts (yet) in those specific areas. In practice this means that percentage of answered questions hovers around 90. Pretty good by itself, but lower than some other sites in network manage to achieve.